I'm now trying to share cafes that I went last year, the progress of updating is quite slow as my day-job has occupy most of my times, and of course the rest seem to take up by outing / gathering with my family and loves one or some errands to run with. I'll still try to dig out some time during weekend to share one or two post(s). Went to Jeeves that located at Love Lane with friends few months back for a short gathering, glad that all of us can made it despite of the hazy weather. The interior. The diners were not much during the time we went, we managed to find ourselves a good seat. Nothing much about the interior but they have two doggy murals which I don't have a good photo to show here. You need to take your own dinning set and seasoning on the rack that provided, plain water is provided as well. Even though diners were not much, but we still waited quite awhile for our food to reach us. Didn't manage to find a good drink for us on the menu, so we opt for the plain water but they charged us RM1 per bottle of plain water since we didn't order their drinks. I never thought cafe will have this kopitiam-style of charges on this. Read through some food blogs before we hit the cafe, most of them recommended this pasta so Sharon ordered this to share with us. Different from normal Aglio-Olio that only cook in olive oil and sprinkle of chili flakes, they cook this in homemade pesto sauce, generous portion of button Shitake, oyster mushrooms and then topped with Parmesan cheese and some roasted garlic. The roasted garlic enhance the taste of this pasta which we find it quite refreshing on the first few bites. The pasta taste good but somehow we didn't finished it as it turned out quite greasy at the end, too much of olive oil I guess. Both BenDan and Florence ordered Carbonara, it makes us slobber just by looking at it. It's a classic pasta with streaky bacon, fresh mushroom and topped with running egg yolk. Quite creamy after you mixed the egg yolk, but if you don't like the raw egg taste, you might not like this dish, the taste has cover the savory cheese taste. Jon's. Didn't really try on it, but he said the portion is too small for him. Overall, it's quite good but he mentioned that the Hollandaise sauce provided is too little, but the salmon is fresh and they also provide quite a lot of greens. I opt for something heavy to share with them and I feel that this is worth the penny as the portion is so big that I cannot finish it by myself. It's breaded pork loin with Bechamel sauce on greens that sandwich between six-cereal toast, it also served with crispy wedges. I always prefer wedges than fries. The pork loin was so crispy and not so greasy, it will be better if they provide more Bechamel sauce. 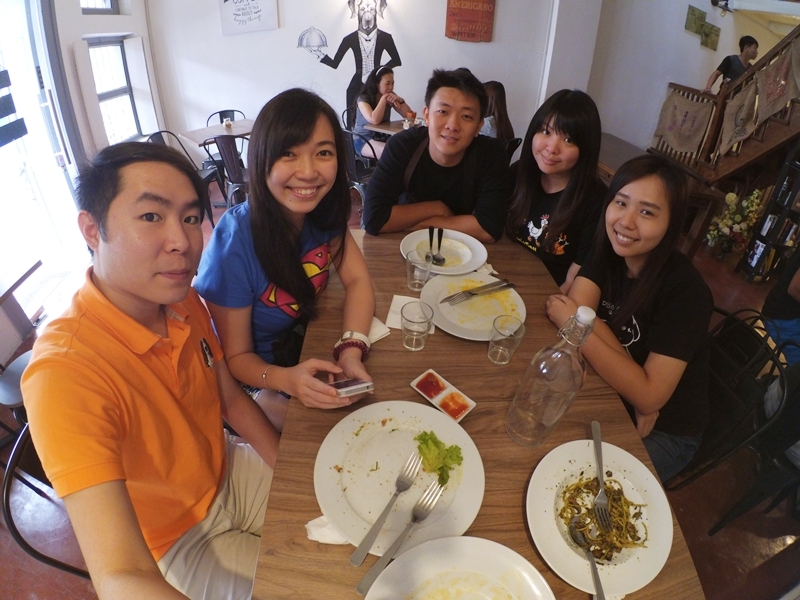 Group photo taken using XiaoYi action camera, will definitely blog about it soon once I'm free. We will be meeting up quite often now as something big is coming soon on March! 71, Love Lane, 10200 Georgetown, Penang.